Grand Opera is a complicated affair. Big scores, vast staging, precision blocking, and multiple leads all vie for audience attention, creating production demands that test the most seasoned opera companies. Add an internationally renowned mezzo-soprano and certified diva to the mix, combine with one of the most recognized, oft produced, and masterfully scored opus in all of opera and the audience arrives to the theater with some mighty weighty expectations. Sunday, I surrendered my usual afternoon spot on the couch in front of the televised Panther game to experience Il Trovatore. Produced by Opera Carolina and featuring megastar, Denyce Graves, OC’s season debut was set to be a blockbuster. I expected to be carried away and impressed by OCs performance this Verdi classic tale of vengeance and misdirected love. Far from disappointed, I left the theater aglow from a standout performance that rivaled any of their productions over the past three seasons. OC struck fire on all counts with their ensemble cast, finely crafted staging, even tempered orchestral pacing and a chorus that does justice to the star power they are there to support. 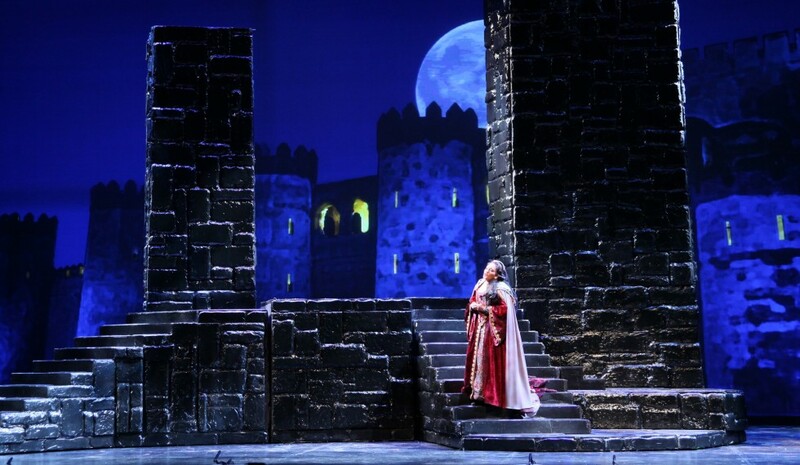 This performance, like OC’s 2010 Otello, elevated the opera game in town and put the QC on notice that grand opera, done in a very grand style is not limited to locales further north. The tale of star-crossed brothers, the object of their desire and a vengeful gypsy queen unspooled with daring and aplomb, riding atop the masterful score of Giuseppe Verdi. Composer of more than two dozen operas, Verdi is undoubtedly one of the finest in the art of grand opera, a form which commands the attention of both the audience and performers. He has been Maestro James Meena’s go to muse of late with Otello in OC’s 2010 season, La Traviata last year and now, Il Trovatore. And why not? With the support for only three opportunities to engage an as yet to be committed Charlotte audience, Meena is wise to bring out the big guns, so to speak. Last month while on holiday in Hungary, I had the opportunity to attend a performance of Verdi’s Simon Boccanegra at the historic Budapest Opera House. Even though it was performed in Italian, with Hungarian supertitles, I had little trouble following the dark plot and sentiment expressed by the characters. Verdi is anything but subtle. His score and pacing can at times overwhelm with emotion, thunderously leaving no doubt as to the message he is try to send. His librettists, mostly equal to the task, deal with treachery, lechery, revenge and regret in methods that even intricate plot twists cannot disguise. With Il Trovatore, Verdi worked with librettist, Salvatore Cammarano for their fourth and final teaming. Cammarano died with the libretto only partially completed and Verdi then turned to Leone Emanuele Bardare. This proved to be a charmed union as the result is surely one of Verdi’s triumphant works. Deftly cast, OCs staging makes the most of the fine material provided. Of particular note was the pairing of of Antonello Palombi’s Manrico and Lisa Daltirus’ Lenora . The dramatic coupling executed strong harmonics and complemented each other majestically in each of their duets. Daltirus all but stole the show with her opening aria in Act one and gave the afternoon’s most powerful performance throughout, especially in the third Act which she practically carried by herself. At one point she sung of heaven on earth and delivered a slice right to the audience. Her mellifluous nightingale cadence and lilt demonstrating both depth and range, she possessed stellar command of the nuanced role of Lenoara. Graves was positively feline in her movement and showed the power and vocal range that has made her so desirable by companies world wide. Her duet with Palombi in the penultimate scene evoked the tenderness a mother feels for her child and her own acceptance of her fate. Palombi’s buttery rich tenor held the three quarters full Belk audience spellbound for nearly three hours with vocal authority matched by his charismatic stage presence. Michael Corvino, the fourth voice in the quartet of players, showed fine restraint with his Count di Luna, a role that can easily be played over the top. Corvino held his own with his stronger counterparts in playing the villainous foil and antagonist who is dealt the losing hand in the end. Maestro James Meena had his orchestra uplifting the performers voices, never overpowering them and showed his signature impeccable pacing, getting the most from his players. OC’s chorus is again worthy of special mention. Is there a more entertaining opportunity for a volunteer troupe than Trovatore’s anvil chorus? Our locals responded with gusto in this and in each of their many opportunities to shine, notably the soldier march at the beginning of Act three. The combination of Jay Lesenger’s staging and the always creative lighting by Michael Baumgarten employed some not seen before elements on OCs stage. The HD imagery of moonlit castles, mountainous hideaways and interior dungeons worked well creating alternative somber and alluring backdrops. One third into their season, Opera Carolina has set a high bar; one if achieved with Madam Butterfly and Eugene Onegin, will put the region on notice that Charlotte is a destination city for its opera.